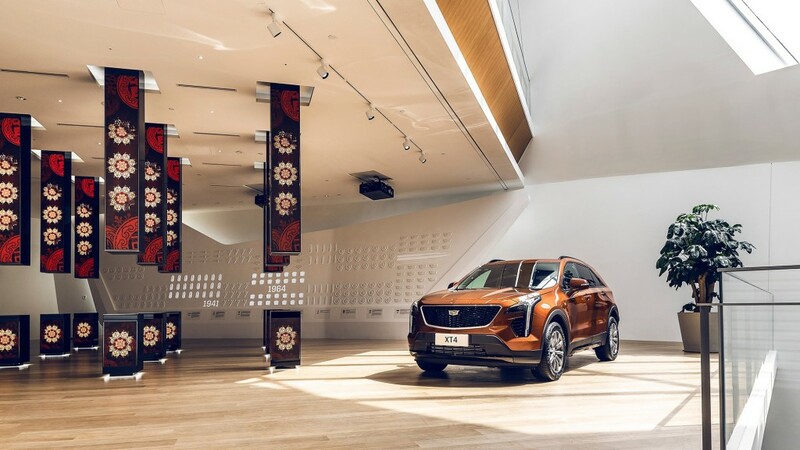 Cadillac House, General Motors’ plan to parade the American luxury brand in front of potential customers through a bespoke, museum-like experience, now has a new location in Shanghai that’s open. The location, a three-story, 6,444-square-meter space, will function as “contemporary museum and cultural center for Cadillac.” Customers will experience the brand’s luxurious legacy and future technologies. It sits across the street from SAIC-GM’s Cadillac Plant. The prime location next to the factory allows customers to see their vehicle being built and then take delivery at the Water Stage outside Cadillac House, which includes a turntable at the center of the fountain. The first floor, called Cadillac Arena, is billed as “expansive and flexible.” It’s a multimedia venue that houses the Cadillac Life display that highlights the brand’s partnerships with designers. A similar staircase takes visitors to the second floor where there’s the Virtual Reality, Digital Forest, Cadillac Soundscape where visitors can explore more than 100 songs that feature Cadillac. The third floor, which visitors get to via a “Guggenheim-inspired staircase,” is home to an auditorium for media events and a VIP lounge for private meetings. The first Cadillac House opened in 2016 in New York City in the same building as Cadillac’s headquarters, which has since moved back to Michigan. The goal of such spaces is for Cadillac to deliver a rich, high-end experience to people without the pressure of salespeople, brochures, and other high-pressure sales tactics. Previous Houses have been home to art exhibits, fashion pop-ups, and even coffee shops. There is a Cadillac House in Munich, Germany, too. what became of Cadillac House Munich? Same as NYC? The Asians can make something great and elegant like this, meanwhile Mary Barra dresses in Walmart clothes and does her hair and nails like a teenage girl. And you wonder why GM brand value is minimal. Cadillac House Munich is a typical GM PR BS. it was just a temporary exhibition. GM for many years lied about Cadillac repair shop chain on their EU website. In fact those service stations never existed or were Opel service stations that didn’t want to touch Cadillac. Warren, Michigan, meet the writing on the wall. Oh, and let’s not forget those dropping sales, falling stock price, angry workers who were fired, and massive rebates being applied to your vehicles as the ship is sinking. Funny how Asia can do American better than companies like GM that pretend to be American. Asians love REAL American products and heritage, not companies that farm everything out to Mexico and China because they can’t figure out how to produce in the U.S. profitably even though many other “foreign” companies can. And Asians somehow figure out how to design, build (quickly too) brand centers like this in Shanghai when idiots in GM can’t make it work in their own home country. Ever seen the Starbucks stores in Asia? Yup, they get the great innovative designs and branding, we get the derivative, leftover crap and then idiot bureacrats complain why sales are down…Morons everywhere. Listening, Mary? Wonder how long it’ll be before they close it…two years? Five perhaps? I mean I get why the “Beancounters” didn’t want Cadillac HC in NYC but I will never understand why they closed down the Cadillac House as well in NYC.